Download The Big Sick in Digital HD from the iTunes store. 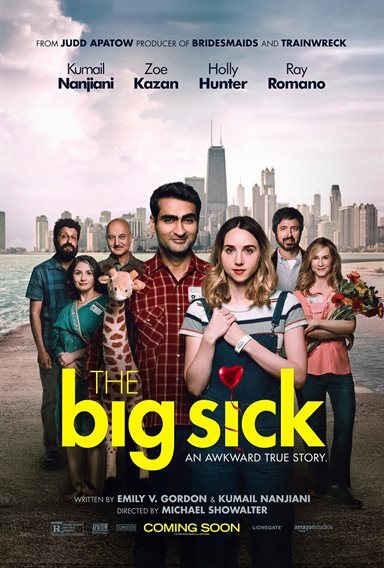 The Big Sick images are © Amazon Studios. All Rights Reserved. We all feel pressure from our parents… get a good education, get a good job, get married, have a family, etc. But for some, that pressure becomes even greater when religious beliefs are thrown into the mix. For Kumail (Kumail Nanjiani; Silicon Valley), that is exactly the life he leads. Unfortunately, that isn't the life he wants and it all comes to head in the film The Big Sick. Kumail is a Palestinian American living in Chicago. He drives for Uber to help supplement his "career" as a standup comedian. Every week he has dinner at his parent's home where, inexplicably, another young, Palestinian woman "drops by" unexpected to join them in Kumail's mother's attempt to find him a good Muslim woman for him to marry. She also pesters him about going to Law school - another idea he hates. Everything changes one night when Emily (Zoe Kazan; Ruby Sparks) comes to the club where Kumail performs. They end up hooking up and what seems to be "a one-time thing" becomes much more when they start dating. However, everything changes when Emily realizes Kumail hasn't told his parents about her and their cultural clash comes crashing down around them. Then Kumail gets a call that Emily is the hospital and suddenly he is caught up in a whirlwind with her parents while she is in a coma. As they bond over their shared distress and concern for Emily, everything changes. The story is based on the real-life experience of Nanjiani and his wife Emily V. Gordon and while it is categorized as a romantic comedy it is much more than that. There is drama intertwined throughout the film and it touches upon numerous subjects including religion, racism, family pressures and finding one's own voice in a sea of conversation. I would say it's more of a dramedy and a good one at that. Nanjiani is pretty good in this role but I wouldn't expect much less since he is essentially playing portions of himself. Kazan strikes a chord as the free-spirited Emily and she draws the audience in so we feel we know her even though she doesn't spend all that much time on screen awake. Holly Hunter (The Piano) and Ray Romano (Everybody Loves Raymond) are fantastic as Emily's parents. They have great chemistry together and with Nanjiani. For me, at least, they are one of the highlights in a truly terrific film. The script is heartfelt and well done. Nanjiani and Gordon infuse humor into a story full of moral dilemmas and hard choices, heartbreak and courage. There is a balance of somber moments interspersed with comedic scenes that whip the audience from one extreme to the other. They tackle controversial topics they struggled with in the real lives and in translates beautifully on screen. Director Michael Showalter (Hello, My Name is Doris) is sensitive enough to take on these subjects and show them with a slightly humorous light without diminishing the seriousness of their message. However, I feel he started the film off on the slow side and it took a little bit to get going but, once it built up, it engaged on every level. It's one of those movies you don't want to end. The sincerity of the tale and the unexpected success of Nanjiani as the male lead make The Big Sick tantalizing and infectiously (pun intended) appealing. In a world full of explosions and car chases, this movie offers something different and executes it nicely.